He is witty, charismatic and exceptionally clever. 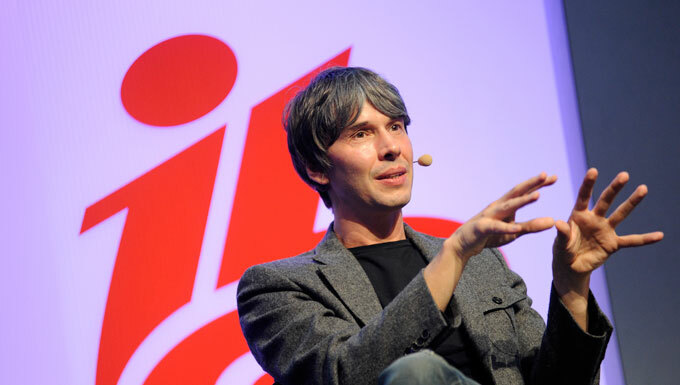 Once a keyboard player in a rock band, Cox is now a particle physicist and one of the leaders of the Large Hadron Collider project. He has been called "the new David Attenborough" - by David Attenborough. So I should probably hate him. But he proved to be extremely engaging. Raymond Snoddy was interviewing him and clearly got so frustrated by his charm he challenged Cox to define the Higgs Boson in under a minute, in terms which everyone could understand. When he did it in about 20 seconds he got a huge round of applause and Ray got even grumpier. The conversation ranged around a whole range of subjects, including a wonderful story about the time Cox met William Anders, the Apollo 8 astronaut who took that iconic series of earthrise pictures, the first time the whole of the earth had been photographed. Cox was expecting a considered response when he asked Anders about how he took the pictures. In fact the response - while hilarious - included the F word so could neither be broadcast nor included in detail in a respectable magazine like this. But the subject that Cox kept coming back to was the importance, and the power, of public service broadcasting. He said that he was turned on to science by happening upon Carl Sagan's 1980 series Cosmos. "I don't want a society where you are a 15 year old and you can sit in your bedroom and watch the computer games channel 24 hours a day," he told IBC. "I want that 15 year old to be exposed to ideas. In the past television has done that." That prompts two thoughts. First, that there must be broadcasting that is delivering the sort of mixed content that can show a soap or a sport then follow it with imaginatively made science, taking the viewer with it. That is not something that needs to be left to state broadcasters who have the obligation to inform, educate and entertain. Cosmos, the original series that inspired him has just been remade - by Fox of all people. So there must be money in it. The second point is that it is not easy to make this sort of programme. He said that he had made 19 hours of serious documentary television so far, and he really only regarded one hour of it as really any good. He thinks one episode of his next series is quite good, too. There was also a nice sequence where he talked about how television is best made collaboratively, but not too collaboratively. He reckoned about four people - the academic, the producer, the director and the editor, maybe - should have full and frank exchanges of views (he admitted he could be a bit of a prima donna) to get the best out of the show. Any more than that and the conversations would be counter-productive, he said. But for me the really interesting part of the conversation was the need to offer people things that they do not know they wanted to watch. "How do we protect that in an environment where you choose precisely the sort of content you want to watch," Cox asked. "This is where I want to see the innovation working for society," he continued. "I challenge the idea that the ultimate goal is choice. It's really about informed choice. Do we see ourselves in television as part of society or as deliverers of things that we know people want? Or is it some kind of a middle ground?" Now with all due respect, that is something I have been saying for some years. The idea of all the content in the world being just out there and people plucking what they want will not work, in my eyes, because how do people know what they want. Not just the teenager about to be turned on to a life of science or history or whatever, but any viewer looking for anything other than series 96 of Downton Abbey or X Factor or Masterchef or Top Gear. The good news is the challenge has now been laid down by someone who everyone respects and we should all listen to. So come on: how can we keep traditional, linear, "this is going to be good for you" channels in the world of TV Everywhere? If you have an idea, please let me know.